We understand that switching to new maintenance management software can be a daunting prospect for so many reasons—There’s always a learning curve, it can be expensive, and there’s no guarantee that everyone in your organization will be on board. But with the right software provider, making the switch doesn’t have to be painful. 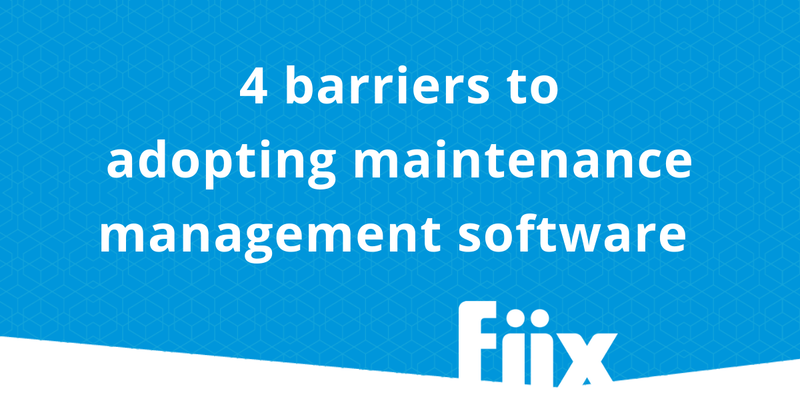 At Fiix, we spend a lot of time talking to a lot of people about why they do and don’t want maintenance software. From those conversations we’ve collected the four biggest concerns for anyone adopting a CMMS, and paired each concern with solutions and resources to help navigate the transition. Budget is the number one barrier for anyone considering switching to maintenance management software. It’s an investment, no matter which way you cut it. But modern, cloud-based software is far less expensive than its on-premises cousin. On top of the relatively low cost of the software itself, a CMMS can have a huge impact on your bottom line. It can help turn your maintenance department from a cost centre into a value centre, since the software helps you gather data on assets and make more educated decisions about where and when to use maintenance resources. First and foremost, do your research. You know your company and your maintenance team, so you’re in the best position to choose maintenance management software that will help, not hinder daily operations. Resources like Capterra are great for comparing different vendors and will help you make sure you get a solution that’s appropriate for your company size and technical know-how. If you need a bit more help narrowing down your options, read our short guide to choosing a CMMS. But once you’ve chosen software, how do you convince the powers that be to invest? Building a good business case is essential because outlining the financial benefits of maintenance management software helps get buy-in from senior executives, and leads to more support in terms of dollars and IT resources. But oftentimes the people who really see the benefit of maintenance software—the maintenance managers and technicians who use it on a day-to-day basis—don’t have the time to build a really compelling business case. Luckily, this is an easy problem to solve. We went ahead and created a business case to help you sell maintenance management software to the higher-ups at your organization. In terms of installation, cloud-based software takes the cake for ease of use because there’s no on-site installation. Once you buy your software, it’s just a matter of logging in and you’re good to go. But how easy it is to import assets really depends on your specific maintenance management software. There are a lot of CMMS vendors, and their products run the gamut from very simple to ‘IT expertise required’. With Fiix, you can easily import existing assets and data from CSV or Excel, which makes setup really straightforward. We also have a huge number of resources to help you navigate the first few days and weeks with your CMMS, including an amazing team of customer success specialists who are here to support you along the way. If you want a step-by-step look at setting up Fiix, check out our free CMMS implementation guide. You can’t just drop new software on your maintenance team and expect them to adapt. Bad change management can lead to resistance, which can delay or even halt software implementation. We’ve addressed this particular challenge before. Basically, there are three simple ways to help manage resistance to change. No one likes being told things are changing once the ball is already rolling. Get input from your maintenance team right from the start, so you can get a CMMS with features that bolster your team’s productivity. Be sure to stress that it’s mostly business as usual, and be clear about what parts of the routine will change to help people adjust to the transition. There is nothing as good as hands-on experience to help a new system seem a lot less daunting.